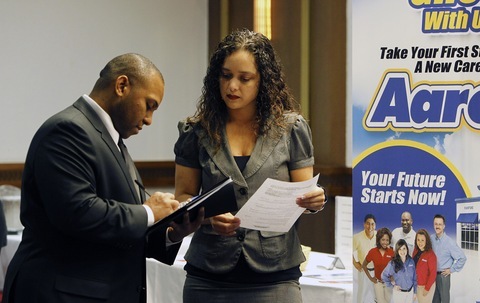 Recruiter Esther Aranza reviews job seeker Andrew Jack Jr.’s resume during a career fair in Texas. Photo by Aaron M. Sprecher/Bloomberg via Getty Images. The unemployment rate continued to trend downward Friday, reaching 8.3 percent, the lowest rate in three years. We calculate U-7, our own more inclusive statistic that adds the underemployed and those who want a job but have been out of work so long the government no longer counts them. U-7 is down to 16.9 percent for January. That’s the lowest we’ve seen since we started tracking the figure in January 2010. With a very healthy 243,000 new jobs added in January, the picture is certainly brightening. The last time the unemployment situation figures were this good was back in February 2009, President Obama’s first full month in office. See The New York Times for more detail. Note: “New Jobs Added, Revised” and “New Jobs Added Since Jan, 2012, Revised” will return in March. Despite Friday’s cheery numbers, a historically high level of unemployment persists. As we explained Thursday, the Gallup organization has a competing estimate for January, which turns out to be considerably more downbeat. Gallup estimates an underemployment rate of 18.7 percent, and our U-7 total of the un- and underemployed still hovers above 27 million Americans. With that in mind we present an audacious proposal, backed up with some truly sobering historical justification, from our friend at Duke, economist William Sandy Darity. The professor first broached the idea of a federally guaranteed jobs program for every American two years ago at the annual economics meetings. We featured a video with his explanation on Making Sen$e, asking him tough questions about the proposal. The essay, which you can read here, is forthcoming in the Review of Black Political Economy. For the skeptical, you might want to take a look at Darity’s video explanation from 2009, above. We’re interested to know what you think of Darity’s proposal. Let us know in the comments below.